The amount of affordable housing in New York City is shrinking, and Mayor de Blasio’s development plans might not reverse the trend. I’ve been listening to New York City Deputy Mayor Alicia Glen on the radio, explaining the de Blasio administration’s recently announced program for affordable housing, and it’s stirring to hear someone speaking with passion and intelligence about progressive urbanism. I’ve also been wading through a copy of the plan itself, and while moved by its rhetoric and reach, I must admit that the more I read it, the more opaque it gets. The good news is that the numbers are big, the plan embraces a wide variety of interventions, and “affordability” is being defined to embrace the truly poor. The mayor proposes to “build or preserve” nearly 200,000 units (housing about a half-million people) over the next ten years and touts the initiative as “the largest and most ambitious affordable housing program initiated by any city in this country in the history of the United States.” That may be, but it’s tragic—and typical—that the burden of producing affordable housing falls so heavily on the city. And given that 73 percent of the financing is to consist of private capital, there’s the $41 billion question of whether the menu of inducements in the plan will be found sufficiently appetizing. The largest and most ambitious affordable housing programs in the history of the United States were financed by Washington through the loan policies of the Federal Housing Administration (largely directed toward suburban development, which was also stimulated by massive federal investment in highways and other infrastructure) and by the 1949 National Housing Act, which empowered local authorities to administer federal funds for low-income rental housing. Cities got the short end of the stick: the feds spent more than fifteen times as much on the suburbs as they did on urban projects. The New York City Housing Authority (NYCHA)—the most successful public housing agency in the country by almost any measure—was the city’s vehicle for channeling this assistance, and it built over 180,000 units, most of which were constructed in the two decades following World War II (during which Washington facilitated the construction of more than 2 million units for defense workers around the country). To put the urgency behind this number in perspective, the private Stuyvesant Town development on Manhattan’s East River waterfront had received 200,000 applications for 8,757 rental units by the time it opened in 1947. To achieve his goal, Mayor de Blasio proposes to preserve 120,000 existing units and build 80,000 new ones. But how many of these apartments will be truly and permanently affordable? The answer depends on two issues: first, how “affordability” is defined, and second, how best to institutionalize it. The first calculation is based on the relationship between rents and area median income (AMI), with affordable-housing costs generally defined as requiring less than 30 percent of income. This creates a structure of differential affordabilities that the city breaks out into five bands, ranging from “extremely low” to “middle” income. The crisis is acute at all levels: the city’s own numbers suggest a dramatically widening gap between incomes and rents and a rise in households that are “severely rent-burdened”: close to 30 percent of New Yorkers pay more than 50 percent of their income for housing. There are close to 1 million renter households in the city with either “very low” or “extremely low” incomes, but there are fewer than half that number of apartments available to them. And the city has at least another 50,000 people homeless. Affordability is more than a simple issue of physical supply, as the need for space is subject to far less variation than there is in income. Few people suggest that a poor family of four should be housed in an apartment only a quarter the size of the one inhabited by a middle-class family of four earning four times as much, or that it be comparably inferior in construction. The only three tractable variables are the price of land (which is in short supply), the cost of construction and the availability of subsidy. The first issue admits some flexibility, including the use of property in city ownership, a focus on development in neighborhoods with lower costs (such as East New York) and condemnation. The plan doesn’t have much to say about architecture or building methods, save a wee tithe to the idea of encouraging sustainable construction to save on long-term costs and some streamlining of the permitting process. Which leaves subsidy in one form or another. Where will it come from? Not from Washington or Albany, for the most part. Federal funding—which accounts for 85 percent of the budget of the city’s Department of Housing Preservation and Development (which de Blasio promises to double)—has fallen by half; the Section 8 voucher program (which subsidizes low-income rentals) continues to drop; and the plan projects only about 7 percent of its expenditures from the feds and the state, money that is often heavily constrained. Given a relative scarcity of funds for direct investment, the city’s primary negotiable assets are air and taxes. The centerpiece of the initiative involves both: adding a mandatory version of the current voluntary inclusionary zoning bonus to the incentive repertoire and developing a “carefully crafted approach” to harmonize the offer of extra bulk with tax exemptions. These are deals that can oblige that affordability be made permanent. So far, so good, but specifics are lacking: How widespread will the mandate be? Can it be satisfied at remote locations? And will the development community on whom this all depends go along? Nor does the plan really make clear how existing affordability will be maintained. Vowing to “stem the tide of rent deregulation” and “encourage landlords in transitioning areas to restrict incomes and rent” is pie in the sky without clear mechanisms or a commitment to numbers. And there’s a huge elephant in the room, which is the possibility (indeed, probability) that even with the complete success of this program, the net number of affordable housing units in the city will fall—and fall substantially. With more and more units exiting rent regulation, with market prices continuing to rise, and with increasing amounts of affordable stock being renovated or replaced, the city is experiencing a precipitous decline in low-cost units. According to a study by the Community Service Society, the average loss annually has been about 38,000 units, a 39 percent drop in apartments “affordable to a family with an income at 200 percent of the federal poverty line” during the Bloomberg era. In the last twenty years, the city has lost around 250,000 rent-stabilized units alone. An average annual loss of 38,000 units over the next decade would entail—even if Mayor de Blasio’s plan was a complete success—a net loss of 180,000 units. Without money, the city must deal in its most primary resource: air space. “To become a more affordable city, we must become a denser city,” insists Deputy Mayor Glen. Really? Although I tend toward the Friedrich Engels position—“there is already a sufficient quantity of houses in the big cities to remedy immediately all real ‘housing shortage,’ provided they are used judiciously”—I tire of the uninflected idea of density that has become such a staple of neoliberal urbanism. As the mayor’s plan suggests, what’s needed is something more than square feet. The objective of planning should be the creation and defense of good neighborhoods, rich and diverse in people and use, and managing density is just one piece of the puzzle. My anxiety about this plan is that—as with the previous administration—the instruments are too blunt. Great places require incremental change, community participation, adequate investment, infrastructures of all kinds and design. The fantasies of the Bloomberg administration were coldly quantitative: if we can just manage the FAR (floor-area ratio), the rest will follow. I worry about the yet-to-be-proven capacity of the de Blasio administration to plan beautifully and sustainably, but I have high hopes. A good way to get this plan started would be to focus on city-owned land and to design it exactingly. It also makes sense, as the city’s plan and the Community Service Society suggest, to concentrate efforts on gentrifying neighborhoods, where the poor are at greatest risk of displacement. And not to sound like a broken record, but let’s return to building housing ourselves. 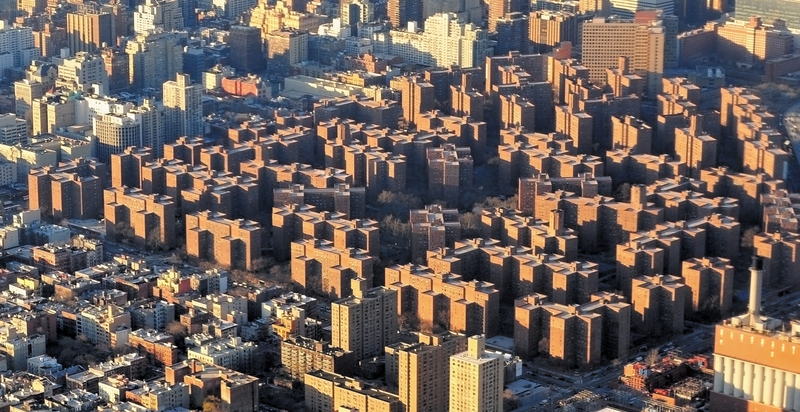 In 1950 alone, NYCHA built an astonishing 35,000 units. Indeed, throughout the 1950s, virtually 100 percent of subsidized housing in the city was public housing. We’ve learned a lot since then about cities and their design, about ghettos and projects. Let’s put it to use! The Royal Institute of British Architects (RIBA) just voted to call for the expulsion of the Israeli Association of United Architects from the International Union of Architects, which in 2005 condemned the participation of Israeli architects in building settlements and the failure of the IAUA to oppose it. My thoughts about this are unequivocally mixed. I find Prime Minister Benjamin Netanyahu odious, the Israeli occupation vile (and undeniably apartheid), and the participation of architects in any of this immoral: were I a member of RIBA, I would have voted for the motion. But there is always something disquieting about the sheer volume of condemnation of Israel by bien-pensant types in the creative classes. Likewise, I’ve always found boycotts of organizations (such as Israeli universities) that provide a home to strong voices of opposition to be tactically unclear-cut, and there are reasonable people on both sides of the argument. While all outrage is selective, there is still a reckoning to be had in the struggle against global injustice. To simply answer critics who wonder why the RIBA hasn’t condemned Syria, the Chinese occupation of Tibet, North Korean fascism or supermax prisons in the United States with the riposte that it’s irrelevant to what we’re talking about now is insufficient. Likewise, the “if you’re not part of the solution” argument doesn’t really cut it, if isolated from our wider world of woe. Evil is not divisible in the act, only the motive. The RIBA motion was canny enough to be specific in its framing, to attack the complicity of Israeli architects in the construction of the settlements and the wall, for their collusion in a clear breach of international law. And it is always uplifting to see professional organizations take progressive political and moral positions, which, to its credit, the RIBA did by disengaging from South African institutions during apartheid. Nevertheless, if one were to compile a matrix of the official expressions of Western outrage by comparable bodies, the predilection for this particular evil is too clear not to demand some supplementary explanation, perhaps cultural, perhaps psychoanalytic. Selective outrage is only ever gainsaid by a plenitude of protest, and I await the RIBA’s next motion. Construction worker deaths in Qatar, anyone? Indentured servitude in Dubai? Glen Small is one of the dear eccentrics of American architecture, at once gifted and cantankerous. He’s had something of a checkered career but was an early leader both in the movement for green building and in keeping the faith with the happy, trippy-hippie hand-built morphologies of the ’60s and ’70s. Some years ago, he moved to Nicaragua and, during the mayoral administration of Herty Lewites in Managua, was awarded a number of commissions. The most visible (and delightful) was La Concha Acústica, a performance shell on the capital’s lakeside Plaza de la Fe. It’s Small’s finest work, with a fluidly rising form like a cresting wave or flickering flame. Sturdily built in cast concrete, it once formed the backdrop for many a civic celebration and was much loved. It has just been torn down with tremendous difficulty, and its tenacity and resistance puts the lie to claims by the authorities that the shell was structurally unsound, at risk of tumbling in the next big seismic event, and thus had to go. Instead, the demolition appears to be the result of revanchist Sandinista politics. Lewites, who built four structures by Small during his administration, was an early partisan in the struggle against Somoza and became minister of tourism in the first Ortega government. But he eventually fell out with Ortega and became a major player in the oppositional Movement for Sandinista Renewal during the 1990s, then rejoined the Sandinistas and was elected mayor in 2000. After another split, he went back to the MRS and ran for the presidency in 2006. He died of a massive heart attack four months before the election. In a grieving exchange of letters among Glen’s friends, one writer described the government as behaving like the Taliban. Yes.